What is the CHOOSE Function? The CHOOSE function is categorized under Lookup and Reference functionsFunctionsList of the most important Excel functions for financial analysts. This cheat sheet covers 100s of functions that are critical to know as an Excel analyst. It will return a value from an array corresponding to the index number provided. 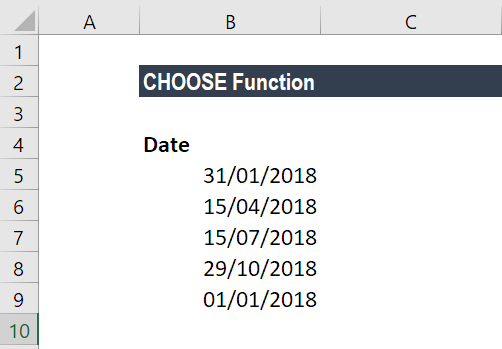 The function will return the nth entry in a given list. As a financial analyst,Financial Analyst Job DescriptionSee a real Financial Analyst Job Description including all the skills, experience, and education required to be the successful candidate for the job. Perform financial forecasting, reporting, and operational metrics tracking, analyze financial data, create financial models the CHOOSE function is very useful when creating scenarios in financial modelsTypes of Financial ModelsThe most common types of financial models include: 3 statement model, DCF model, M&A model, LBO model, budget model. Discover the top 10 types of Excel models in this detailed guide, including images and examples of each. Financial modeling is performed for many reasons including to value a business, raise money. By using the CHOOSE formula, an analyst is able to select between 5 difference scenarios (for example) that can flow through the entire model. 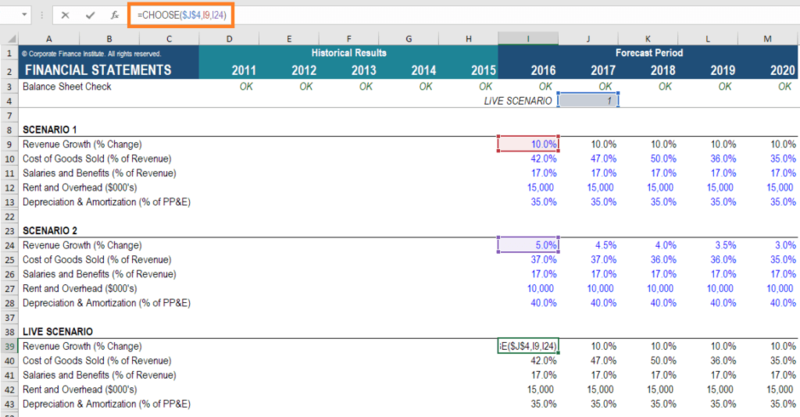 Scenario analysisScenario AnalysisScenario analysis is a technique used to analyze decisions through speculating various possible outcomes in financial investments. In financial modeling, this process is typically used to estimate changes in the value of a business or cash flow. By using the Choose or Offset functions an analyst can crease base case is an important part of building a robust financial model. Learn more, in CFI’s scenario and sensitivity analysis course. Index_num (required argument) – It is an integer that specifies which value argument is selected. Index_num must be a number between 1 and 254, or a formula or reference to a cell containing a number between 1 and 254. Value1, Value2 – Value1 is a required option but the rest are optional. It is a list of one or more values that we want to return a value from. If index_num is 1, CHOOSE returns value1; if it is 2, CHOOSE returns value2; and so on. Value1, value2 must be entered as individual values (or references to individual cells containing values). If the argument index_num is a fraction, it is truncated to the lowest integer before being used. If the argument index_num is an array, every value is evaluated when CHOOSE is evaluated. The value arguments can be range references, as well as single values. 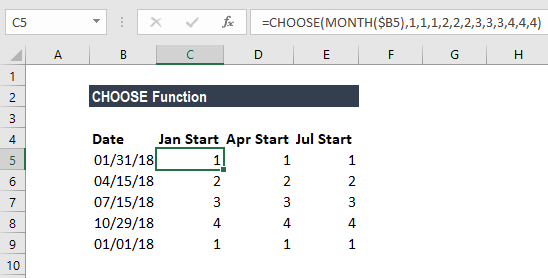 How to use the CHOOSE Function in Excel? We can calculate the fiscal quarter from the dates given above. The fiscal quarters start in a month other than January. The formula returns a number from the array 1-4, which corresponds to a quarter system that begins in April and ends in March. The given index_num is less than 1 or is greater than the given number of values. The given index_num argument is non-numeric. #NAME? error – Occurs when the value arguments are text values that are not enclosed in quotes and are not valid cell references.